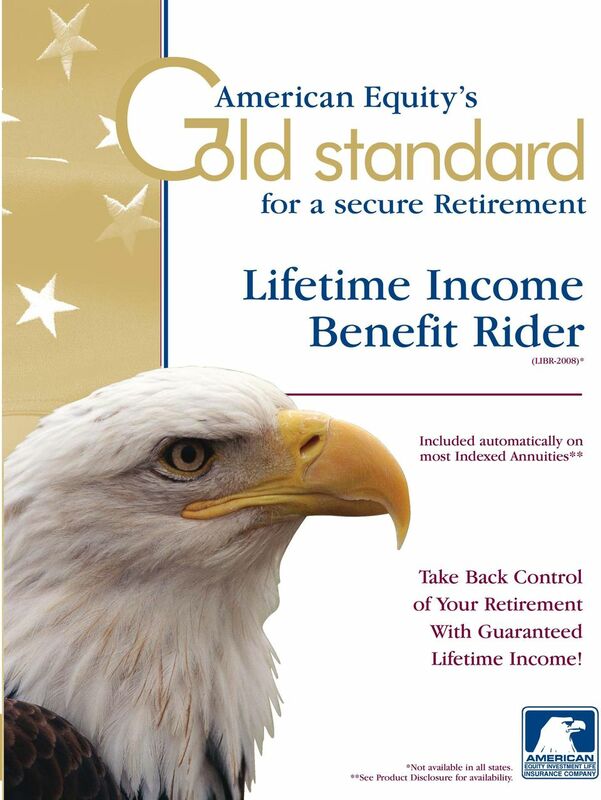 1 for a secure Retirement Lifetime Income Benefit Rider (LIBR-2008)* Included automatically on most Indexed Annuities** Take Back Control of Your Retirement With Guaranteed Lifetime Income! *Not available in all states. **See Product Disclosure for availability. 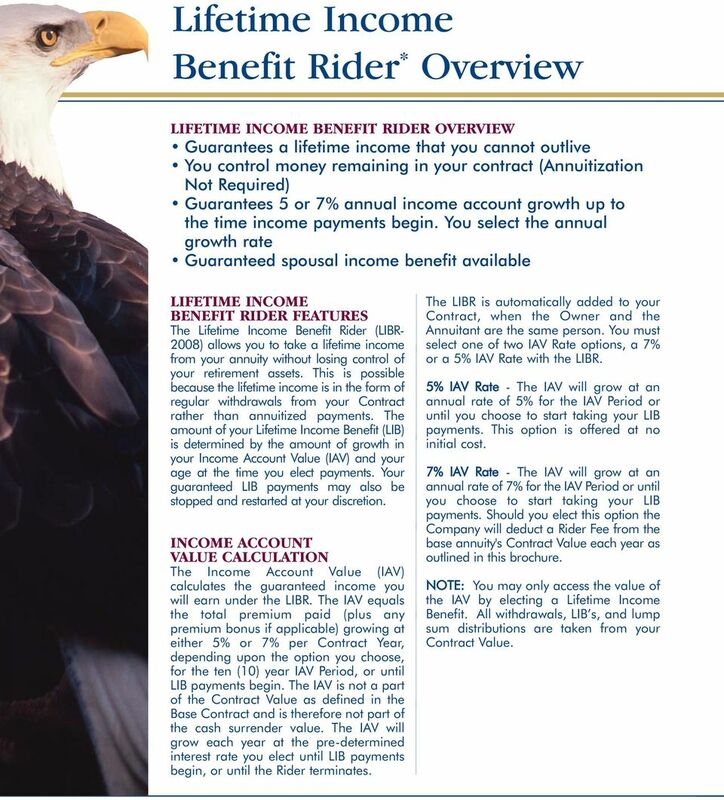 2 Lifetime Income Benefit Rider * Overview LIFETIME INCOME BENEFIT RIDER OVERVIEW Guarantees a lifetime income that you cannot outlive You control money remaining in your contract (Annuitization Not Required) Guarantees 5 or 7% annual income account growth up to the time income payments begin. You select the annual growth rate Guaranteed spousal income benefit available LIFETIME INCOME BENEFIT RIDER FEATURES The Lifetime Income Benefit Rider (LIBR- 2008) allows you to take a lifetime income from your annuity without losing control of your retirement assets. This is possible because the lifetime income is in the form of regular withdrawals from your Contract rather than annuitized payments. The amount of your Lifetime Income Benefit (LIB) is determined by the amount of growth in your Income Account Value (IAV) and your age at the time you elect payments. Your guaranteed LIB payments may also be stopped and restarted at your discretion. INCOME ACCOUNT VALUE CALCULATION The Income Account Value (IAV) calculates the guaranteed income you will earn under the LIBR. The IAV equals the total premium paid (plus any premium bonus if applicable) growing at either 5% or 7% per Contract Year, depending upon the option you choose, for the ten (10) year IAV Period, or until LIB payments begin. The IAV is not a part of the Contract Value as defined in the Base Contract and is therefore not part of the cash surrender value. The IAV will grow each year at the pre-determined interest rate you elect until LIB payments begin, or until the Rider terminates. The LIBR is automatically added to your Contract, when the Owner and the Annuitant are the same person. 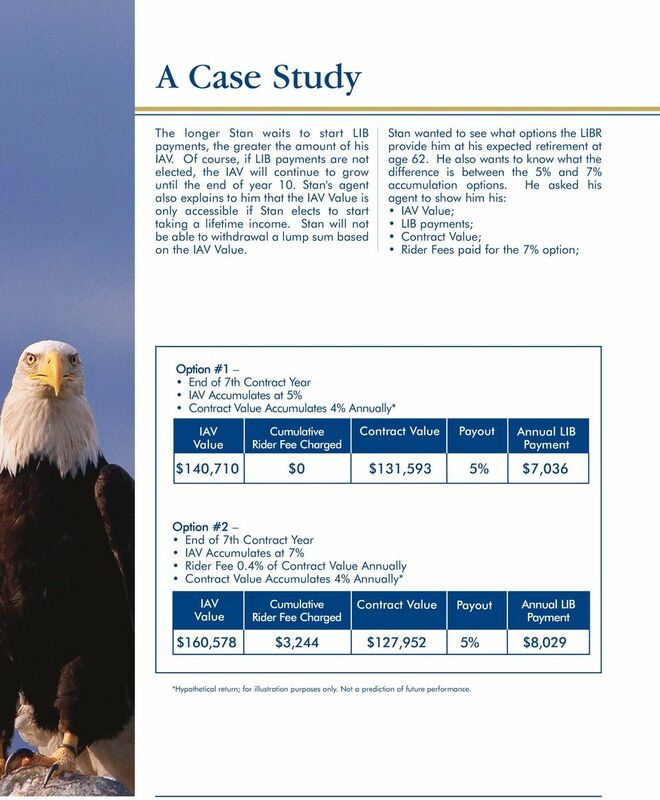 You must select one of two IAV Rate options, a 7% or a 5% IAV Rate with the LIBR. 5% IAV Rate - The IAV will grow at an annual rate of 5% for the IAV Period or until you choose to start taking your LIB payments. This option is offered at no initial cost. 7% IAV Rate - The IAV will grow at an annual rate of 7% for the IAV Period or until you choose to start taking your LIB payments. 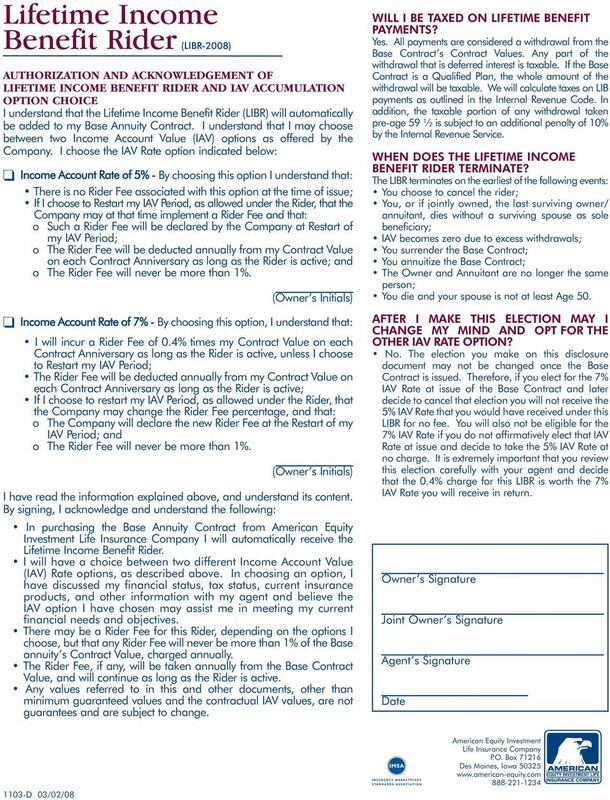 Should you elect this option the Company will deduct a Rider Fee from the base annuity's Contract Value each year as outlined in this brochure. NOTE: You may only access the value of the IAV by electing a Lifetime Income Benefit. 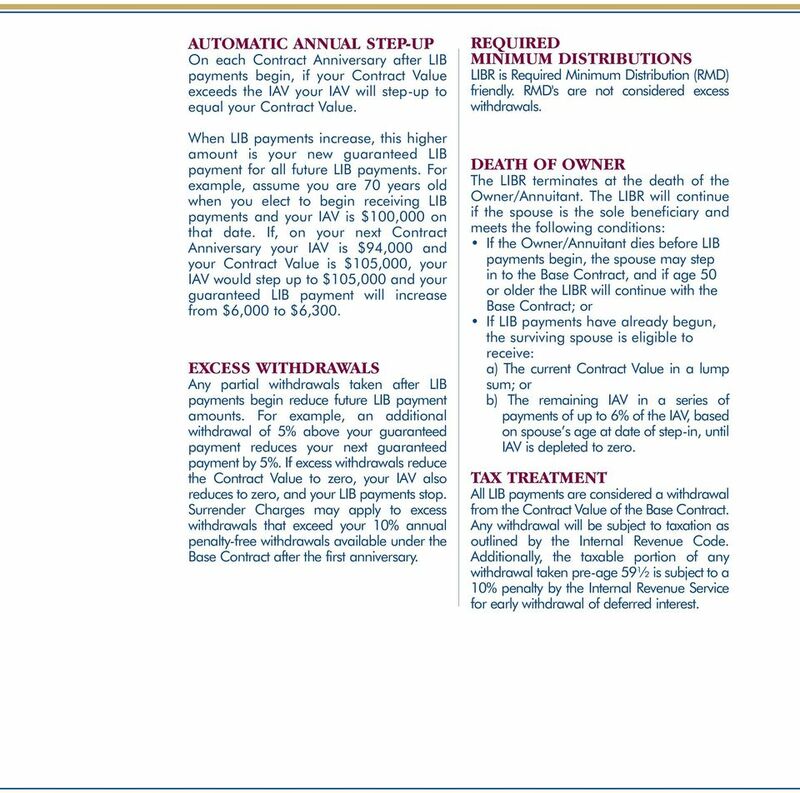 All withdrawals, LIB s, and lump sum distributions are taken from your Contract Value. 3 RIDER FEE There is no Rider Fee initially for the 5% IAV Rate option. For the 7% IAV Rate option, a Rider Fee will be taken from your Contract Value every year as long as the LIBR remains active. The Rider Fee is set at Contract Issue, and is guaranteed for the IAV Period. If you choose to Restart the IAV Period for either the 5% IAV Rate option or the 7% IAV Rate option, the Company may change the Rider Fee. The Rider Fee will never be more than 1% annually. NOTE: Because the 7% IAV Rate option will have a Rider Fee currently of 0.4%, it is extremely important that you review this election carefully with your agent to ensure the charge against your contract value is worth the 7% IAV rate. LIFETIME INCOME BENEFIT ELECTION You may elect LIB payments anytime after the later of: Your 1st Contract Anniversary; or After you reach age 50. You can elect to receive your LIB payments monthly, quarterly, semi-annually, or annually. Your LIB payments are based upon your age at time of election and a percentage of the IAV as shown here: NOTE: LIB payments will reduce your contract value but are guaranteed for your life even if your contract value is zero (withdrawals in excess of LIB payments will reduce future LIB payments). Owner / Annuitant's Minimum Age at Election of LIB GUARANTEED INCOME PERCENTAGE OF IAV Single Owner / Annuitant Percentage of IAV Joint Owner / Annuitant Percentage of IAV % 3% % 4% % 5% 80+ 7% 6% *LIBR-2008 availability may vary by state; may not be available with all Base Annuity Products. Ask your agent for details. 4 AUTOMATIC ANNUAL STEP-UP On each Contract Anniversary after LIB payments begin, if your Contract Value exceeds the IAV your IAV will step-up to equal your Contract Value. When LIB payments increase, this higher amount is your new guaranteed LIB payment for all future LIB payments. For example, assume you are 70 years old when you elect to begin receiving LIB payments and your IAV is $100,000 on that date. If, on your next Contract Anniversary your IAV is $94,000 and your Contract Value is $105,000, your IAV would step up to $105,000 and your guaranteed LIB payment will increase from $6,000 to $6,300. EXCESS WITHDRAWALS Any partial withdrawals taken after LIB payments begin reduce future LIB payment amounts. For example, an additional withdrawal of 5% above your guaranteed payment reduces your next guaranteed payment by 5%. If excess withdrawals reduce the Contract Value to zero, your IAV also reduces to zero, and your LIB payments stop. Surrender Charges may apply to excess withdrawals that exceed your 10% annual penalty-free withdrawals available under the Base Contract after the first anniversary. REQUIRED MINIMUM DISTRIBUTIONS LIBR is Required Minimum Distribution (RMD) friendly. RMD's are not considered excess withdrawals. DEATH OF OWNER The LIBR terminates at the death of the Owner/Annuitant. The LIBR will continue if the spouse is the sole beneficiary and meets the following conditions: If the Owner/Annuitant dies before LIB payments begin, the spouse may step in to the Base Contract, and if age 50 or older the LIBR will continue with the Base Contract; or If LIB payments have already begun, the surviving spouse is eligible to receive: a) The current Contract Value in a lump sum; or b) The remaining IAV in a series of payments of up to 6% of the IAV, based on spouse s age at date of step-in, until IAV is depleted to zero. TAX TREATMENT All LIB payments are considered a withdrawal from the Contract Value of the Base Contract. Any withdrawal will be subject to taxation as outlined by the Internal Revenue Code. Additionally, the taxable portion of any withdrawal taken pre-age 59½ is subject to a 10% penalty by the Internal Revenue Service for early withdrawal of deferred interest. 6 A Case Study The longer Stan waits to start LIB payments, the greater the amount of his IAV. Of course, if LIB payments are not elected, the IAV will continue to grow until the end of year 10. Stan's agent also explains to him that the IAV Value is only accessible if Stan elects to start taking a lifetime income. Stan will not be able to withdrawal a lump sum based on the IAV Value. Stan wanted to see what options the LIBR provide him at his expected retirement at age 62. He also wants to know what the difference is between the 5% and 7% accumulation options. He asked his agent to show him his: IAV Value; LIB payments; Contract Value; Rider Fees paid for the 7% option; Option #1 End of 7th Contract Year IAV Accumulates at 5% Contract Value Accumulates 4% Annually* IAV Value Cumulative Rider Fee Charged Contract Value Payout Annual LIB Payment $140,710 $0 $131,593 5% $7,036 Option #2 End of 7th Contract Year IAV Accumulates at 7% Rider Fee 0.4% of Contract Value Annually Contract Value Accumulates 4% Annually* IAV Value Cumulative Rider Fee Charged Contract Value Payout Annual LIB Payment $160,578 $3,244 $127,952 5% $8,029 *Hypothetical return; for illustration purposes only. Not a prediction of future performance. 7 WHAT IS THE INCOME ACCOUNT VALUE? The IAV is used to calculate the Rider s Lifetime Income Benefit (LIB). It is not part of your Contract Value, as outlined in the product brochure and Base Contract, and is only used to calculate your LIB amount. Your initial IAV is the initial premium you deposit, plus any premium bonus. The IAV will grow at the IAV Rate, which is set at issue and will continue to grow until the end of the IAV period. LIB payments will reduce both your contract value and IAV. WHEN CAN I BEGIN TAKING MY LIFETIME INCOME BENEFIT PAYMENTS? You may begin taking LIB payments anytime after the first Contract Anniversary. Of course, the longer you wait, the more time the IAV has to accumulate, and a larger income will be available. The IAV continues to grow until the end of the IAV Period, which expires at the end of the 10th Contract Year unless you submit a written request to restart the IAV Period. Once the IAV Period expires the IAV is locked in and remains at that amount until either the LIBR or the Base Contract expire. CAN I TAKE OTHER WITHDRAWALS FROM MY ANNUITY? Yes. Anytime, either before or after election of LIB payments, you may take withdrawals. You may always take up to the Contract Base, less any surrender charge prior to election of LIB payments. Withdrawals taken prior to election of LIB payments will reduce the Contract Value and IAV on a pro-rata basis. A withdrawal after LIB payments start will reduce future LIB payments by the same percentage the withdrawal reduces your Contract Value. If the excess withdrawals reduce the Contract Value to zero, the LIBR terminates and LIB payments will stop D 03/02/08 *Not available in all states. 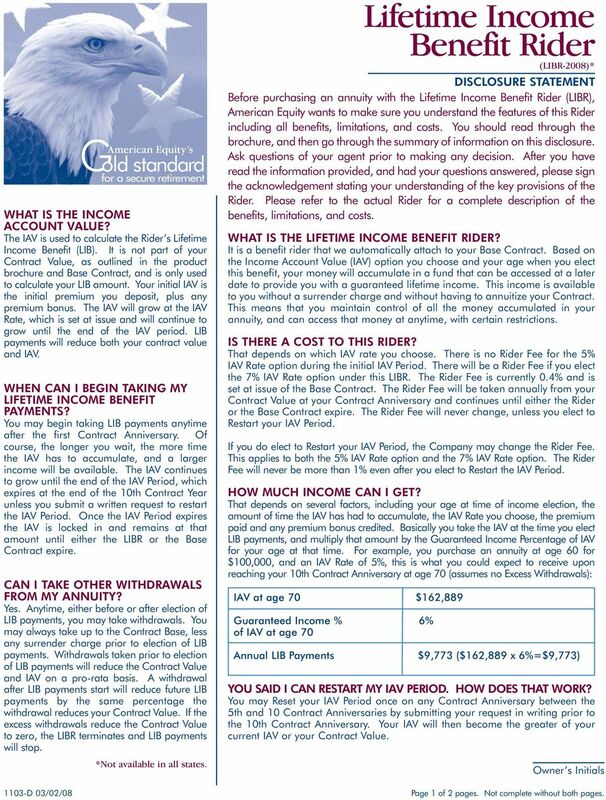 DISCLOSURE STATEMENT Before purchasing an annuity with the Lifetime Income Benefit Rider (LIBR), American Equity wants to make sure you understand the features of this Rider including all benefits, limitations, and costs. You should read through the brochure, and then go through the summary of information on this disclosure. Ask questions of your agent prior to making any decision. After you have read the information provided, and had your questions answered, please sign the acknowledgement stating your understanding of the key provisions of the Rider. Please refer to the actual Rider for a complete description of the benefits, limitations, and costs. WHAT IS THE LIFETIME INCOME BENEFIT RIDER? It is a benefit rider that we automatically attach to your Base Contract. Based on the Income Account Value (IAV) option you choose and your age when you elect this benefit, your money will accumulate in a fund that can be accessed at a later date to provide you with a guaranteed lifetime income. This income is available to you without a surrender charge and without having to annuitize your Contract. This means that you maintain control of all the money accumulated in your annuity, and can access that money at anytime, with certain restrictions. IS THERE A COST TO THIS RIDER? That depends on which IAV rate you choose. There is no Rider Fee for the 5% IAV Rate option during the initial IAV Period. There will be a Rider Fee if you elect the 7% IAV Rate option under this LIBR. The Rider Fee is currently 0.4% and is set at issue of the Base Contract. The Rider Fee will be taken annually from your Contract Value at your Contract Anniversary and continues until either the Rider or the Base Contract expire. The Rider Fee will never change, unless you elect to Restart your IAV Period. If you do elect to Restart your IAV Period, the Company may change the Rider Fee. This applies to both the 5% IAV Rate option and the 7% IAV Rate option. The Rider Fee will never be more than 1% even after you elect to Restart the IAV Period. HOW MUCH INCOME CAN I GET? That depends on several factors, including your age at time of income election, the amount of time the IAV has had to accumulate, the IAV Rate you choose, the premium paid and any premium bonus credited. Basically you take the IAV at the time you elect LIB payments, and multiply that amount by the Guaranteed Income Percentage of IAV for your age at that time. For example, you purchase an annuity at age 60 for $100,000, and an IAV Rate of 5%, this is what you could expect to receive upon reaching your 10th Contract Anniversary at age 70 (assumes no Excess Withdrawals): IAV at age 70 $162,889 Guaranteed Income % 6% of IAV at age 70 Lifetime Income Benefit Rider (LIBR-2008)* Annual LIB Payments $9,773 ($162,889 x 6%=$9,773) YOU SAID I CAN RESTART MY IAV PERIOD. HOW DOES THAT WORK? You may Reset your IAV Period once on any Contract Anniversary between the 5th and 10 Contract Anniversaries by submitting your request in writing prior to the 10th Contract Anniversary. Your IAV will then become the greater of your current IAV or your Contract Value. Owner s Initials Page 1 of 2 pages. Not complete without both pages. 9 WHAT IS THE INCOME ACCOUNT VALUE? 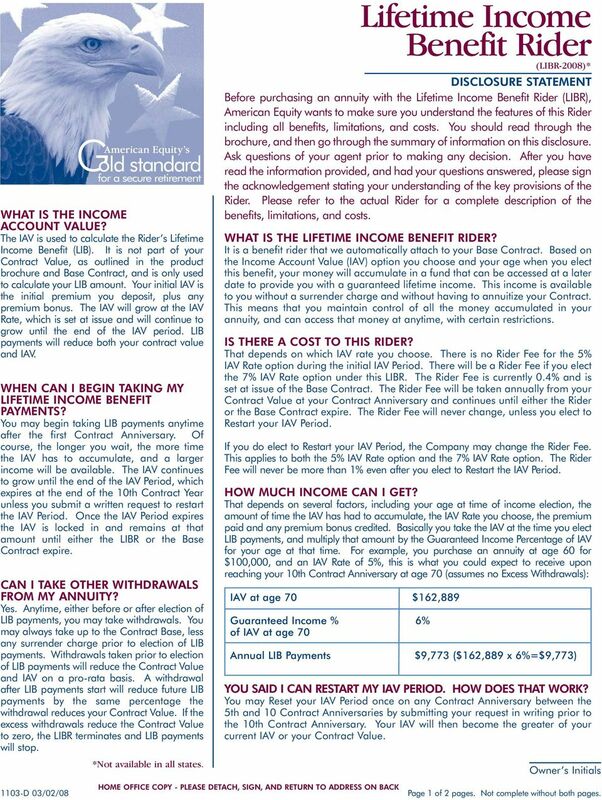 The IAV is used to calculate the Rider s Lifetime Income Benefit (LIB). It is not part of your Contract Value, as outlined in the product brochure and Base Contract, and is only used to calculate your LIB amount. Your initial IAV is the initial premium you deposit, plus any premium bonus. The IAV will grow at the IAV Rate, which is set at issue and will continue to grow until the end of the IAV period. LIB payments will reduce both your contract value and IAV. WHEN CAN I BEGIN TAKING MY LIFETIME INCOME BENEFIT PAYMENTS? You may begin taking LIB payments anytime after the first Contract Anniversary. Of course, the longer you wait, the more time the IAV has to accumulate, and a larger income will be available. The IAV continues to grow until the end of the IAV Period, which expires at the end of the 10th Contract Year unless you submit a written request to restart the IAV Period. Once the IAV Period expires the IAV is locked in and remains at that amount until either the LIBR or the Base Contract expire. CAN I TAKE OTHER WITHDRAWALS FROM MY ANNUITY? Yes. Anytime, either before or after election of LIB payments, you may take withdrawals. You may always take up to the Contract Base, less any surrender charge prior to election of LIB payments. Withdrawals taken prior to election of LIB payments will reduce the Contract Value and IAV on a pro-rata basis. A withdrawal after LIB payments start will reduce future LIB payments by the same percentage the withdrawal reduces your Contract Value. If the excess withdrawals reduce the Contract Value to zero, the LIBR terminates and LIB payments will stop. *Not available in all states. 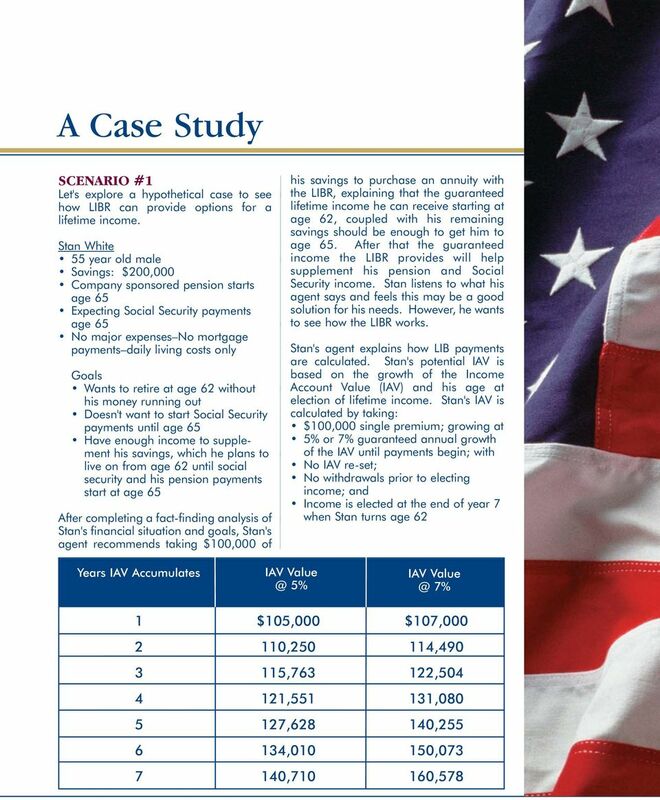 DISCLOSURE STATEMENT Before purchasing an annuity with the Lifetime Income Benefit Rider (LIBR), American Equity wants to make sure you understand the features of this Rider including all benefits, limitations, and costs. You should read through the brochure, and then go through the summary of information on this disclosure. Ask questions of your agent prior to making any decision. After you have read the information provided, and had your questions answered, please sign the acknowledgement stating your understanding of the key provisions of the Rider. Please refer to the actual Rider for a complete description of the benefits, limitations, and costs. WHAT IS THE LIFETIME INCOME BENEFIT RIDER? It is a benefit rider that we automatically attach to your Base Contract. Based on the Income Account Value (IAV) option you choose and your age when you elect this benefit, your money will accumulate in a fund that can be accessed at a later date to provide you with a guaranteed lifetime income. This income is available to you without a surrender charge and without having to annuitize your Contract. This means that you maintain control of all the money accumulated in your annuity, and can access that money at anytime, with certain restrictions. IS THERE A COST TO THIS RIDER? That depends on which IAV rate you choose. There is no Rider Fee for the 5% IAV Rate option during the initial IAV Period. 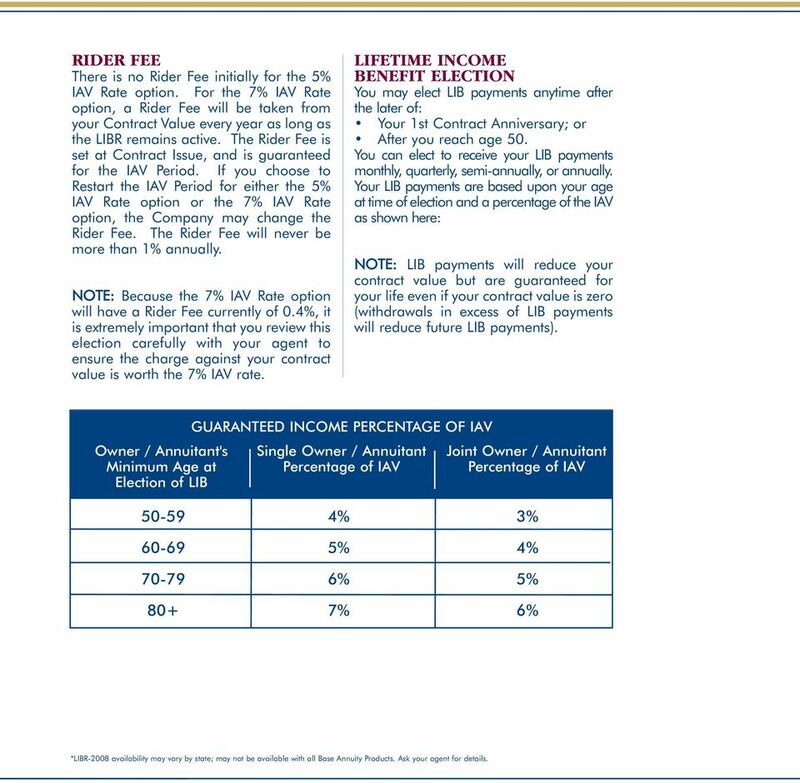 There will be a Rider Fee if you elect the 7% IAV Rate option under this LIBR. The Rider Fee is currently 0.4% and is set at issue of the Base Contract. The Rider Fee will be taken annually from your Contract Value at your Contract Anniversary and continues until either the Rider or the Base Contract expire. The Rider Fee will never change, unless you elect to Restart your IAV Period. 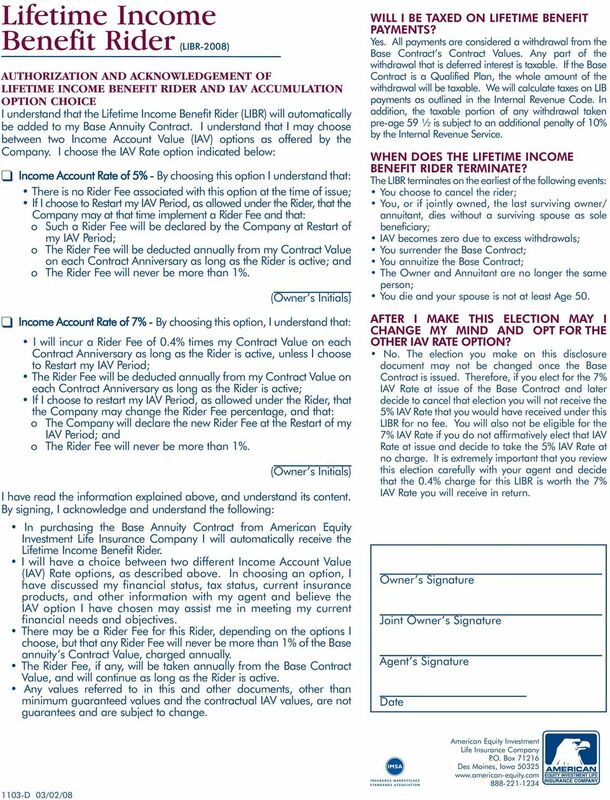 If you do elect to Restart your IAV Period, the Company may change the Rider Fee. This applies to both the 5% IAV Rate option and the 7% IAV Rate option. The Rider Fee will never be more than 1% even after you elect to Restart the IAV Period. HOW MUCH INCOME CAN I GET? That depends on several factors, including your age at time of income election, the amount of time the IAV has had to accumulate, the IAV Rate you choose, the premium paid and any premium bonus credited. Basically you take the IAV at the time you elect LIB payments, and multiply that amount by the Guaranteed Income Percentage of IAV for your age at that time. For example, you purchase an annuity at age 60 for $100,000, and an IAV Rate of 5%, this is what you could expect to receive upon reaching your 10th Contract Anniversary at age 70 (assumes no Excess Withdrawals): IAV at age 70 $162,889 Guaranteed Income % 6% of IAV at age 70 Lifetime Income Benefit Rider (LIBR-2008)* Annual LIB Payments $9,773 ($162,889 x 6%=$9,773) YOU SAID I CAN RESTART MY IAV PERIOD. HOW DOES THAT WORK? You may Reset your IAV Period once on any Contract Anniversary between the 5th and 10 Contract Anniversaries by submitting your request in writing prior to the 10th Contract Anniversary. Your IAV will then become the greater of your current IAV or your Contract Value. Owner s Initials 1103-D 03/02/08 HOME OFFICE COPY - PLEASE DETACH, SIGN, AND RETURN TO ADDRESS ON BACK Page 1 of 2 pages. Not complete without both pages. 11 SCENARIO #2 Stan liked what he saw, both his expected lifetime payments amounts, and the continued growth of his Contract Values. He remained curious about his options if he didn't need to start his LIB payments at age 62. What if he put off taking LIB payments until he was 70 years old? Stan's agent recommended that at age 62 Stan could Restart his IAV period. This meant that Stan could ask the Company to take either the greater of his IAV or his Contract Value on his 7th Contract Anniversary, and have his IAV Restart and accumulate for up to another 10 years from that point. Stan's agent informed him that the Company may change the Rider Fee charged for the 7% IAV option and may implement a Rider Fee for the 5% IAV option but, that the Rider Fee would never be more than 1% of the Contract Value each year. For illustration purposes, the agent left the Rider Fee at 0% for the 5% IAV option and at 0.4% for the 7% IAV option. 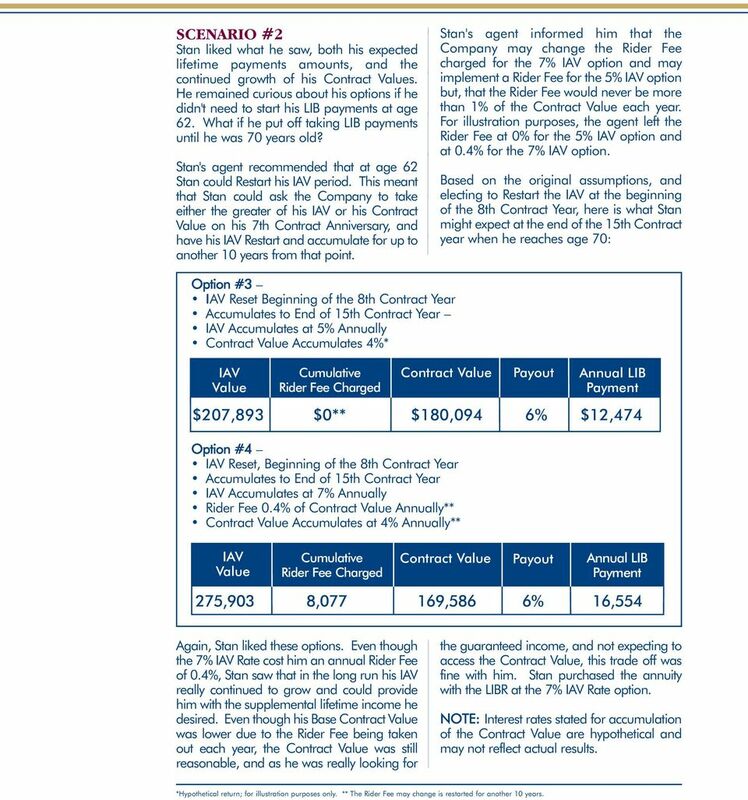 Based on the original assumptions, and electing to Restart the IAV at the beginning of the 8th Contract Year, here is what Stan might expect at the end of the 15th Contract year when he reaches age 70: Option #3 IAV Reset Beginning of the 8th Contract Year Accumulates to End of 15th Contract Year IAV Accumulates at 5% Annually Contract Value Accumulates 4%* IAV Value Cumulative Rider Fee Charged Contract Value Option #4 IAV Reset, Beginning of the 8th Contract Year Accumulates to End of 15th Contract Year IAV Accumulates at 7% Annually Rider Fee 0.4% of Contract Value Annually** Contract Value Accumulates at 4% Annually** Payout Annual LIB Payment $207,893 $0** $180,094 6% $12,474 IAV Value Cumulative Rider Fee Charged Contract Value Payout Annual LIB Payment 275,903 8, ,586 6% 16,554 Again, Stan liked these options. Even though the 7% IAV Rate cost him an annual Rider Fee of 0.4%, Stan saw that in the long run his IAV really continued to grow and could provide him with the supplemental lifetime income he desired. Even though his Base Contract Value was lower due to the Rider Fee being taken out each year, the Contract Value was still reasonable, and as he was really looking for the guaranteed income, and not expecting to access the Contract Value, this trade off was fine with him. 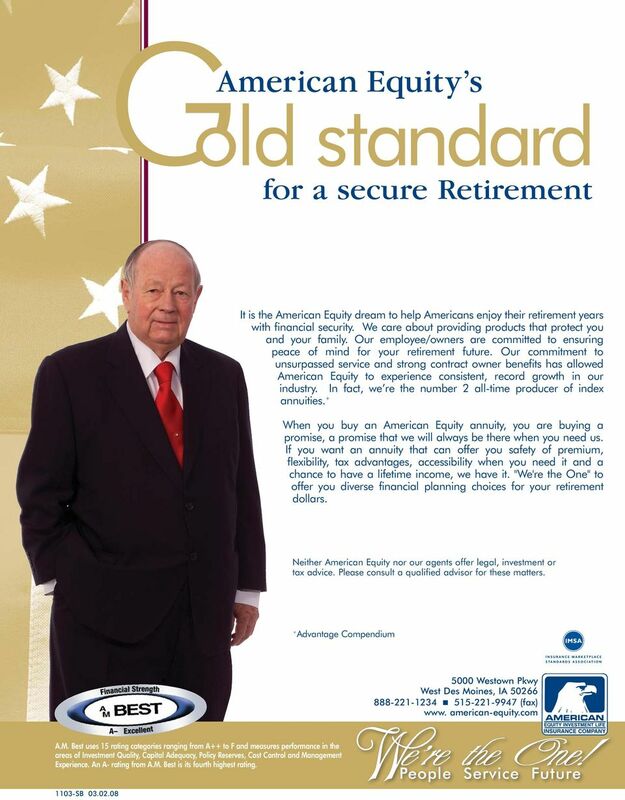 Stan purchased the annuity with the LIBR at the 7% IAV Rate option. NOTE: Interest rates stated for accumulation of the Contract Value are hypothetical and may not reflect actual results. *Hypothetical return; for illustration purposes only. ** The Rider Fee may change is restarted for another 10 years. Guggenheim Life and Annuity Company At Guggenheim Life and Annuity Company, we are 0 Pennsylvania Parkway, Suite 00 dedicated to serving the needs and financial goals Indianapolis, IN 80 of our customers. Steadily growing, safe and secure. Financial values your future can count on. Steadily growing, safe and secure. Financial values your future can count on. Retirement: built by you, grown by you 2 enjoyed by you. Let s not pretend that your retirement will be like anyone else s.